More than a dozen Columbia High School students and their parents attended the Capital Area Art Supervisors biannual Creative Career Night last month at the Sage College of Albany to learn more about college and career opportunities. 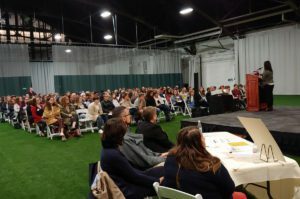 Maureen Sager, executive director of the Upstate Alliance for the Creative Economy, kicked off the evening’s events with a presentation highlighting the strength of the local creative economy. She reported that the creative economy – which includes the arts, design, media and heritage segments – employs more than 47,000 people and generates $1.4 billion in earnings in the Capital Region, thereby making it the fourth largest employment sector in the area. Ms. Sager reassured families that the longstanding notion that one cannot make a living in a creative or art-related career is a myth. Representatives from each field shared their experiences that led to their careers and answered questions from the audience. Students learned the importance of being a self-promoter, a collaborator/team player and someone with strong time management skills. The breakout sessions took place in several buildings across campus, thereby giving students a chance to explore Sage College of Albany. Sage is a leader in the field of blending art and technology and offers numerous opportunities for area high school students to attend gallery openings, artist talks and participate in art-making events throughout the year. Students spoke highly of the event and said they left feeling very encouraged and optimistic about their futures.